Features Exclusive DualBelt Lifting Mechanism For Smooth, Quiet Operation. Ideal for high-speed applications that require light-duty lifting of boxes, cartons, packages, totes, containers or cases. Provides quiet, ultra smooth operation, requires minimal maintenance - lifting belt never needs lubricating. Perfect for use in an automated system, DB Lifts save space and handles loads that are often transported on an inclined conveyor. Versatile, completely self-contained, self-standing and economical. 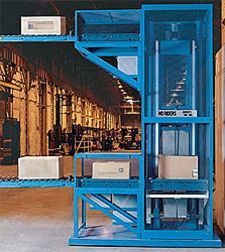 Moves loads to mezzanines, between floors or between conveyor levels. Frame is designed to be self-supporting and constructed of structural tube and steel. Carriage is typically supplied with powered roller conveyor deck. Carriage is cantilever style and may be loaded from any one of three operating sides depending on application. Carriage is lifted and lowered by timing belt attached to an electric motor-reducer assembly mounted on the frame. Power unit employs a 1/2 HP TEFC brake motor mounted to the top of lift frame. Standard power requirements are 230V/460V, 3-phase. Single phase is available upon request. Control voltage is 110V. Control panel and push button station are NEMA 12. Control panel is designed to be mounted to the back of the frame, and all control devices are pre-wired at the factory. A variety of control options are available from basic interface to PLC automated controls. Upward and downward travel of the carriage is controlled by a limit switch. When the switch is tripped, the motor shuts off and the brake is engaged. Overload and carriage overtravel protection is provided. Standard units include full-height enclosures on all sides made of 1/2" expanded metal. Optional expanded metal and sheet metal side guards are available for carriage.